"We will check out [Hollywood] or some other great spots when we take care of business," said Homewood-Flossmoor sprint coach Robert Jones. "This is a business trip first and foremost." He was referring to his charges and the 2600 mile venture to southern California to partake in several meets. The first one was the Tigers Invite hosted by South Pasadena High School just up the road from Arcadia. Over there was a slew of emerging track and field athletes looking to prove why they did not get selected into the prestigious Arcadia Invitational. Along some nice climes, the Lady Vikings picked up a nice haul of medals but more importantly gained some valuable invitational experience for the future when their number is called. It was a split team loaded with future stars with took home gold in the 4x100r (49.59), Ayah Mustafa (300H) IL #1 45.28, and the 4x400m ran away with another state-leading 3:57.57. Speaking of Arcadia, there was a lot going on during the first day, "the burnin' relays" as they call it are the featured events. Homewood-Flossmoor won the girls 800 Sprint Medley Relay in 1:45.57. The key to happy times was a monster leg by junior Ashanti Denton who clocked a 55.58 FAT. Dana Hills of CA took second in 1:46.20. Previously, the Lady Vikings won the rated 4x200 in a state-leading 1:41.82. The usual happy vibe was taken away a bit by an atrocious transition at leg #3. Otherwise, it would have been a sub 1:40 clocking. Chicago Jones College Prep boys have made the Arcadia Invite annual rites of passage for a number of years now. Things were looking up until Friday morning when coach Andrew Adelman had to substitute one of his top guns Ian Bacon who went down with an injury. The results in 4x1600 turned out to be a solid spin. Adelman: "I'm happy with how we competed in the field. We moved up well. It's actually the third year in a row we finished top 10 in the seeded raced. We just didn't have our best race." It has been a tradition for our best to come to California and excel in distance events. Ella Behrens (Chicago Whitney Young) and Brooke Stromsland (Lakes) grouped together in a large pack Rated race. Stromsland appeared to hold back because she ran a leg on the state leading 4x800 (9:37.88) at the start of the meet. Behrens moved up and actually led halfway through in 5:25. Although she faded a tad bit during the final circuit, she was able to leg out a big personal best and state-leading 10:45.10. Stromsland was a stride back in 10:45.76. The boys got into the act as well. Garrett Dixon of Monticello made his first trip to California. He was sitting in second late in the Rated race off of a stagnant pace. Fortunately, Dixon was able to close strong and run a school record 9:15.31. Dillon Blake of Monticello closed hard in the same race and dashed 9:16.14. Bullis (MD) won the girls 4x200 in 1:38.28 with Long Beach Poly second in 1:39.36. Valor Christian (CO) won the 4x100 Shuttle Hurdles in 58.44 with Upland second in 1:00.38. Freshman Allison Neiders of Holy Names (WA) won the pole vault in 12-4, which equals the No. 2 vault in the U.S. by a freshman. Jada Sims of Xavier College Prep (AZ) leads the girls heptathlon with 3,007 points. Jessica Swalve (Westmont/CC) is second at 3,001. 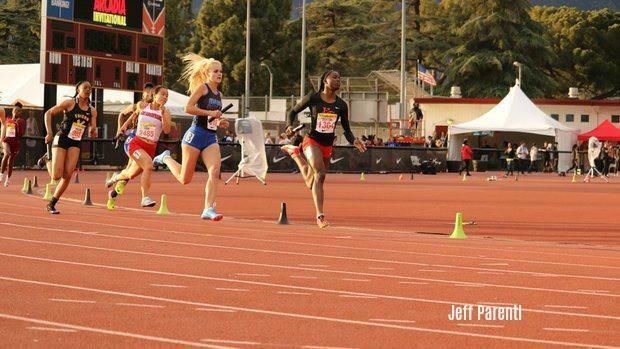 Great Oak CA girls engaged in a tough battle with state foe Mission Viejo in the 4x800m to win a US#1 9:10.24-9:11.31. The Loyola CA boys held off a late charge from state power Great Oak in the 4x800 in a US #2 7:48.13; Great Oak 7:49.96.